ShoreZone takes a close-up inventory of the biology and geology of North America's Pacific coast from Oregon to Alaska and in-between. People use the coastal data, imagery, and maps to manage the coast for the benefit of the many animals and plants, people and industries who depend on it. ShoreZone's baseline data improves our ability to understand, respond to, and plan for the dynamic coastal changes taking place in the Pacific Northwest and Alaska - changes such as increasing storm frequency and coastal erosion, projected increases in shipping traffic, and offshore oil and gas development. With ShoreZone coastal managers have access to data to support planning and response efforts. Dozens of partners are helping to make millions of photos, video, maps, and digital habitat data available online to the public for free. Three primary product types are available: geospatial data, still images, and oblique video. If you are seeking a product format that you do not see on this website please drop us a line and we will see how we can help! 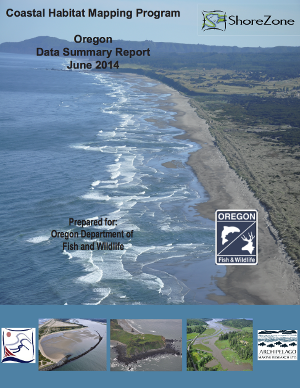 This work was supported in part by the Oregon Coastal Management Program through a Section 309 Program Enhancement Grant from the Office for Coastal Management of the National Oceanic and Atmospheric Administration. Additional funds were provided by Oregon Department of Fish & Wildlife and the Oregon Framework Program. ShoreZone images are being made available under a Creative Commons "CC-BY-SA" license. You can learn more about what that means here. Please cite Oregon ShoreZone, CC-BY-SA.